Rip Currents are common at any beach that is exposed to breaking surf and are the number one cause of rescues that lifeguards perform each year along the coast. They can be extremely dangerous by pulling unsuspecting swimmers and surfers into situations where they are unable to return to shore. Malibu Makos’ reviews rip currents with campers on a regular basis. A rip current (rip tide) is an isolated ocean current that moves away from the beach. They can usually be recognized by their foamy, brown color with mushroom-like shape, and choppy water. However, some rip currents lack color and are harder to spot. The brown color is caused by sand being picked up off the bottom and mixed with the water by the outgoing current. The mushroom shape and choppy water are a result of turbulence caused by the faster moving rip current meeting resistance against the surrounding, more stable water. They can range in size and shape, expand up to hundreds of yards in length, and even migrate up and down the beach. A rip current does not have an undertow that pulls its victims under water. The reason why people drown in rip currents is because they are uneducated and become tired from swimming against the rip current itself. That is why you swim parallel to shore to get yourself out of a rip current. Most rip currents are too strong for a person to successfully swim against. How do rip currents form? 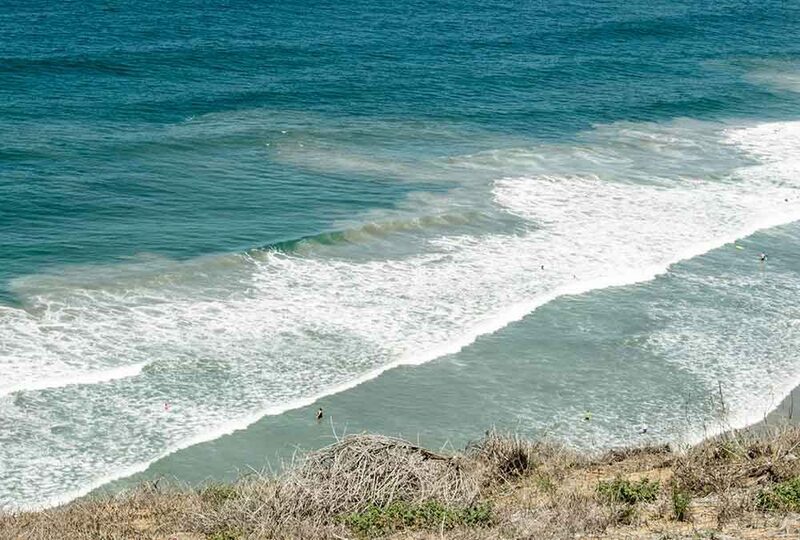 Rip currents are formed when water pushed ashore by side currents and incoming waves, pools together and funnels back out to sea along the path of least resistance. Rips also form when outgoing rivers or streams flow into the ocean. Where sand is the predominant bottom feature, rip currents move out to sea through troughs or “deep spots” in the sand formed by the waves repetitively pounding the shore- line. These types of rip currents are the most unpredictable and can form in a matter of seconds. Where reef or rock is the predominant bottom feature, the water funnels back out to sea through naturally existing channels or gaps between the reefs. These types of rip currents can be extremely powerful and almost impossible to swim against. Where piers, jetties, or other obstructions exist, rip currents are formed when water pushed up against the obstruction by waves and side-currents is forced out to sea in one direction. Always keep a safe distance away from any pier, jetty, rocks, or other obstructions that jut out outward into the surf zone. Some beaches have river or creek mouths that flow out into the ocean. Rip currents commonly form here as the outflow carves a channel or trench in the bottom. Always stay clear of river mouths and riverbanks. How do i avoid getting stuck in a rip current? The Feeder Zone is the base or mouth of the rip current where water begins to move laterally or diagonally to shore as it “feeds” into the outgoing current. Avoid wading or swimming in the vicinity of a rip current. The feeder zone can be strong enough to pull you off your feet and into the outgoing current. It is wise to stay shallower than waist deep to avoid being swept into a rip current by the feeder. The Neck is the fast moving out going flow of the rip current; most of the time it is very difficult to swim directly against the current. If you are being pulled away from shore in the neck, do not fight against the current, swim parallel to shore until you are clear of the outgoing flow and then swim in. The Head is the outer-most part of the rip current that mushrooms out as the current mixes with the surrounding water. If you remain in the rip current, you will eventually end up in the head. The same basic technique of not fighting the current and swimming to the side out of the rip current applies. Do not panic if you are being pulled out into the head of a rip. The current will pull you out, but will not pull you under. If you get stuck in a rip current swim parallel to shore! It is always important to swim near a lifeguard and know the conditions before you enter the ocean. In any case where you are unable to get back to shore on your own, stay calm and raise your hand for assistance from the lifeguard on duty.